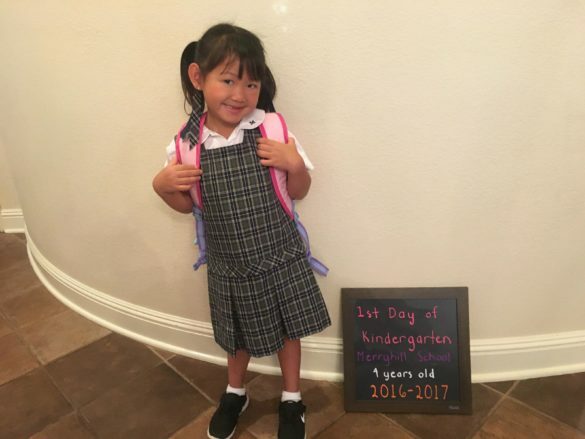 Roxy started Kindergarten this morning! She was so cute. We had fun picking out her new uniform clothing last week. She was so excited to wake up this morning and to take the bus to school. Merryhill School actually has a shuttle going from Merryhill Preschool to the Elementary School so we merely need to drop her off 5 minutes away and then pick up up again at Merryhill Preschool at the end of the day. I can’t believe Roxy is in Kindergarten! It seems like just yesterday we were potty training her and trying to teach her English. Now Roxy is incredibly verbal and talks a lot. She’s so social that I’m not worried about her transitioning to Kindergarten. My baby girl is growing up so fast. She can count to 30, knows all her ABCs, knows days of the week, colors, shapes, and is starting to sound out words. I highly, highly recommend Merryhill Preschool Laguna Park and Merryhill School Calvine. Roxy has really blossomed in the Merryhill system and we really couldn’t be any happier with her progress. I can’t wait to see what Roxy will learn in Kindergarten. May all of your little ones be blessed as they go back to school! I send you all love and light.